The Maritime Coastguard Agency (MCA) is recommending that masts and rigging are serviced according to manufacturers’ guidelines. 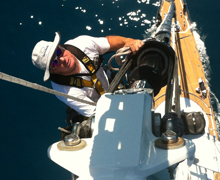 Marine Results will tailor a programme to suit a yacht’s schedule and to meet these criteria. Further ‘in service’ guidance to carbon mast damage was written by the MCA in conjunction with Marine Results over a 2 year period and was issued as their Marine Information Note 417 (M). The guidance is contained in the MCA’s booklet LY3 The Large Commercial Yacht Code, in their section rigging 4.5.1, which is reproduced here. 4.5.1.1 The condition of the rig should be monitored in accordance with a Maintenance Manual and a planned maintenance schedule. The schedule should include, in particular, regular monitoring of all the gear associated with safe work aloft and on the bowsprit. 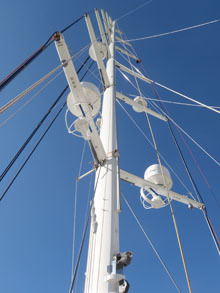 Marine Results undertakes a rig inspection with the mast in and still fully rigged, inspecting from top to bottom, reviewing key areas such as the sheaves, pins, spreader roots and tips, backstay, forestay and runner tangs. We issue an update in the rig log-book and issue a report of recommended maintenance. This type of inspection should be performed on all craft after any major passage, or at least once a year regardless of age or usage. Some rod heads are cut and re-headed and some rods replaced dependent on the service period.